Over the years, I’ve tried various pie crust recipes–butter only, shortening only, butter and shortening combination–and have finally found the perfect one. The use of both butter and shortening gives this recipe the kind of flaky, buttery crust that apple pie dreams are made of. The filling is layers of apples and delicious goo (as my family refers to it) with just the right amount of sweetness. Perfection. This recipe is actually a mashup of two recipes I’ve made in the past. I used the filling from one and crust from another, with a little tweaking to make it just right. The crust is foolproof, easy to work with, and versatile–I’ve used it to make lattice crusts as well as cut outs, so have fun with it. 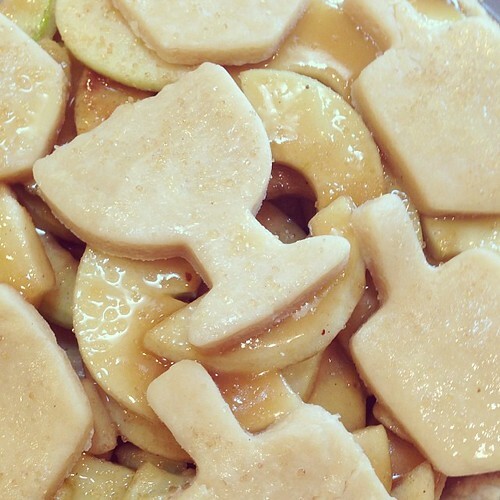 I used dreidel and menorah cut outs for one of the pies. It was Thanksgivukkah after-all! p.s. See that goo? Yum! During Thanksgiving dinner, this pie was declared “the perfect apple pie” by everyone at the table, so my apple pie recipe search is officially over. I hope you enjoy it as much as we did! Combine the flour, sugar, and salt in a food processor; pulse several times to mix. Remove the lid and scatter the butter pieces over the dry ingredients. Pulse the machine 5 or 6 times to cut in the butter. Roll the bottom crust to fit a 9-inch pan and chill for 15 minutes before baking. Pre-bake the bottom crust for 15 minutes, using pie weights on top of a piece of parchment paper. Peel, core, and slice apples. Add cinnamon and mix. Set aside. Melt butter in a saucepan then stir in flour to form a paste. Add water, white sugar, and brown sugar, and bring to a boil. Reduce temperature and let simmer. Place pie plate on cookie sheet (to catch drips while baking). Fill bottom crust with one layer of apples, pour 1/3 of the filling liquid over the apples, then repeat with a second layer. 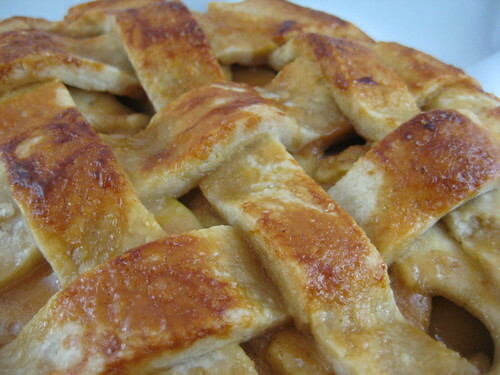 Cover with a lattice top crust (or cut outs) and gently pour the remaining filling liquid over the crust. Sprinkle crust with turbinado sugar. Bake 20 minutes at 350 degrees F, then reduce the temperature to 325 degrees F. Continue baking for 25 to 45 minutes, or until apples are soft. Crust recipe adapted from Apple Pie by Ken Haedrich. Filling recipe adapted from All Recipes. Apple pie is our family’s favourite. Thank you for this brilliant recipe as we like to try different ones.